Fresh Wild Salmon topped with seasoning and herbs to excite your tastebuds. Topped with creamy Odyssey Greek Yogurt to the perfect combination of light and sultry. 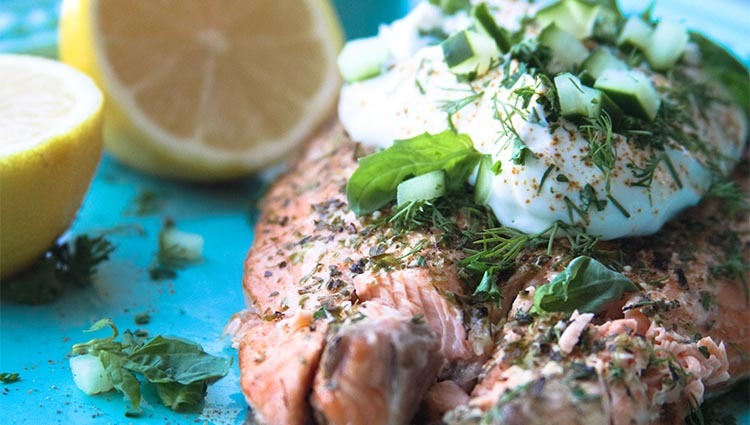 Fresh Salmon with herbs and greek yogurt. Preheat oven to 325 degrees F. Line shallow baking pan with parchment paper. Place salmon in prepared pan. Sprinkle with salt and black pepper. Drizzle with olive oil; rub into salmon. Sprinkle with oregano. Roast 25 to 30 minutes until fish flakes easily when tested in the center with a fork. Meanwhile, remove zest from lemon; set zest aside. Halve lemon; squeeze over salmon. top salmon with some of the greek yogurt; sprinkle with lemon zest and remaining ingredients. Drizzle with olive oil and pass remaining greek yogurt. Make ahead, after roasting salmon, cover and chill up to 24 hours. Serve chilled or at room temperature.